It’s difficult to live in Japan, or even visit for a short time, without becoming aware of the popularity and prevalence of green tea. For me tea equals a cup of tea but Japan has brought its green tea to a whole new level. On my first visit to Japan, it was summer and it was hot and I had no Japanese reading skills but I did have the courage to try out one of those ice-cream vending machines that Japan loves. I saw green ice-cream, put my money in the slot and with great anticipation retrieved what I thought was a minty ice-cream from the machine. Did I say it was hot? I unwrapped my treat, bit into it, and instead of a fresh minty experience my taste buds were assaulted by the unfamiliar, and at that moment unwelcome, taste of green tea. Yuck! Even now, as a veteran of Japanese living, my opinion hasn’t changed much … I still like my tea, no matter what color, in a cup and in liquid form but where’s the fun and adventure in that? Recently, I visited Gyokuro-no-Sato, in Shizuoka prefecture where we ate lunch at the restaurant, Chanohana-tei. 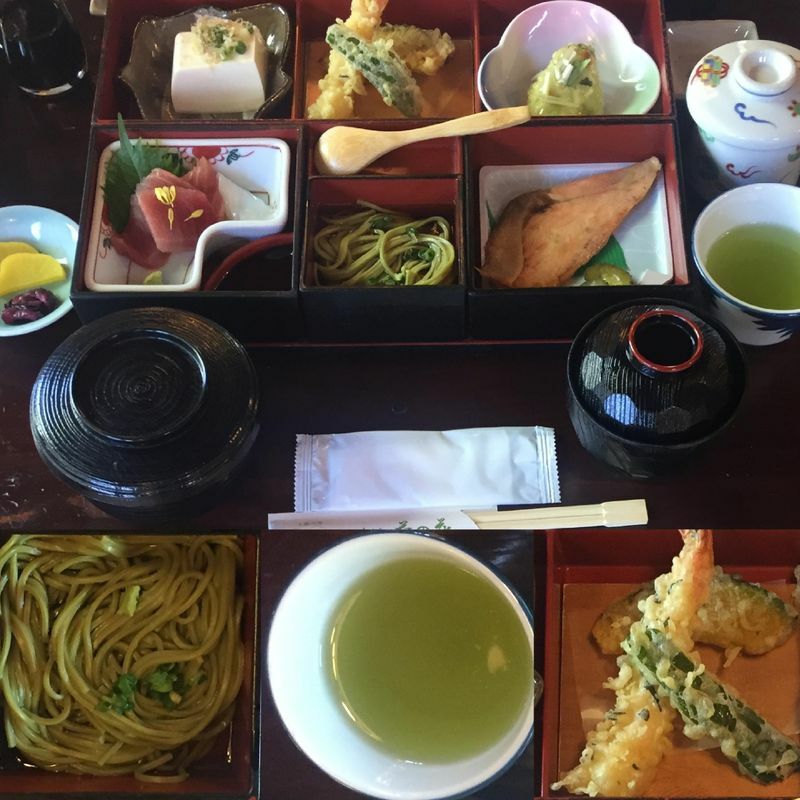 The theme of the day was green tea and we were treated to the best of it: the tempura had flecks of green tea in the batter, the soba, the chawan mushi, and even the salt for the tempura were green tea flavored, and of course green tea was served with the meal! This is not a meal I would normally seek out but to my surprise it was delicious and it was fun to try something new and different. To top the meal off we were served green tea ice cream. I declined, as my taste buds are still traumatized from my historic vending machine experience, but I heard the others say it was some of the best ice cream they have ever had! 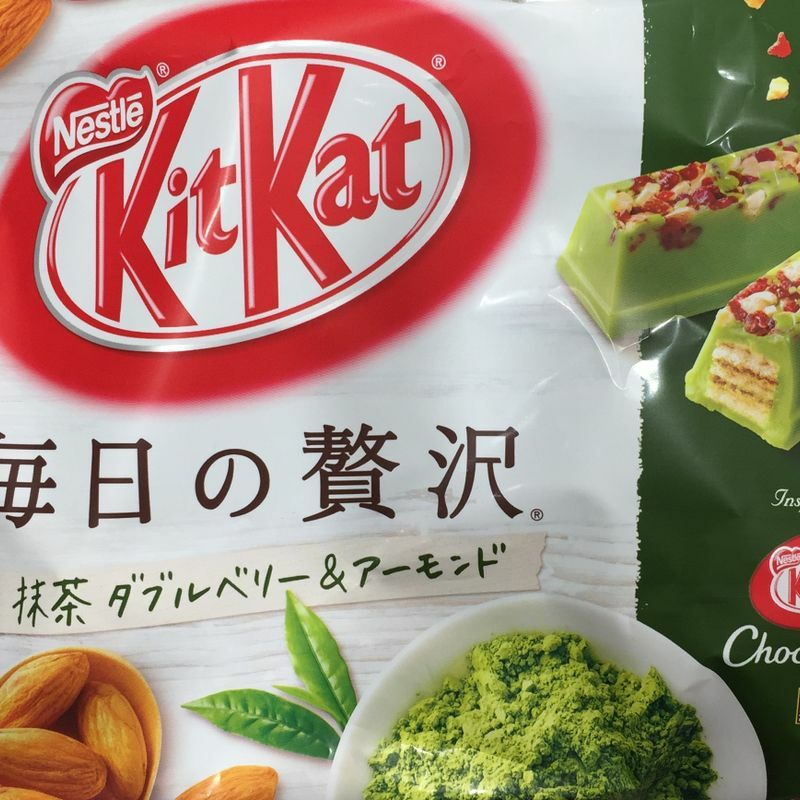 In recent years more and more green tea flavored items are appearing and becoming commonplace on the shelves of Japanese grocery stores. Some examples are candies and cake, like the baum roll shown in the photos here but Nestle’s Kit Kat and Nabisco’s Oreo are the two that took me by surprise. 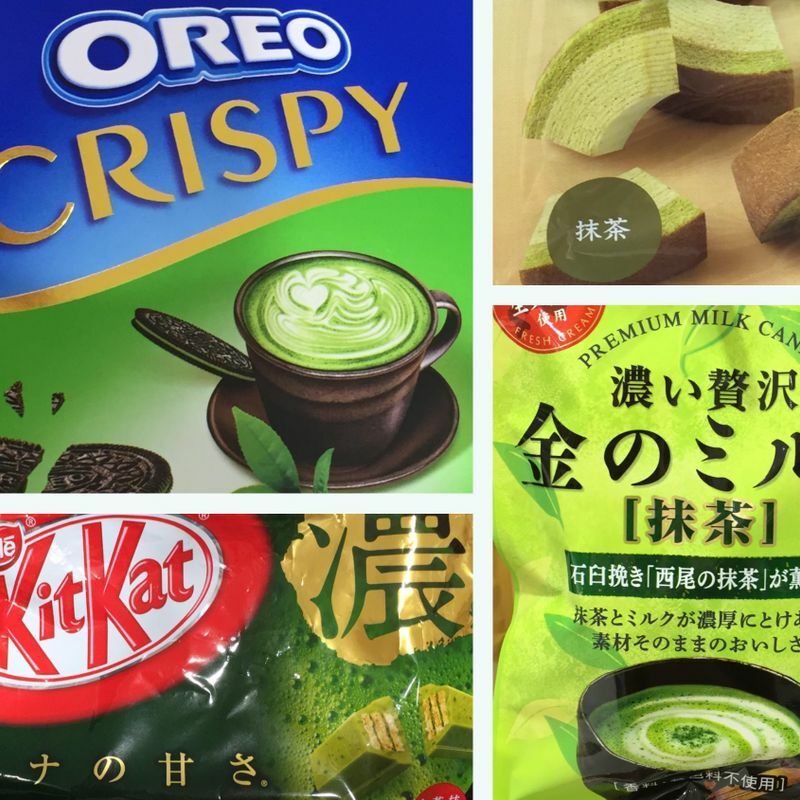 Nestle have a range of different green tea flavored Kit Kats and Oreo have changed their trademark creamy center for a green tea flavored center; can this truly still be called an Oreo? Like the ice cream these are not for me but because of their peculiarity they are great gifts for friends and family at home. All this begs the question of “How do you like your green tea?” I have my own favorite: make a pot of (for me weak) green tea and add a peppermint teabag and leave it steep for a few minutes; a great and healthy way to start any day? 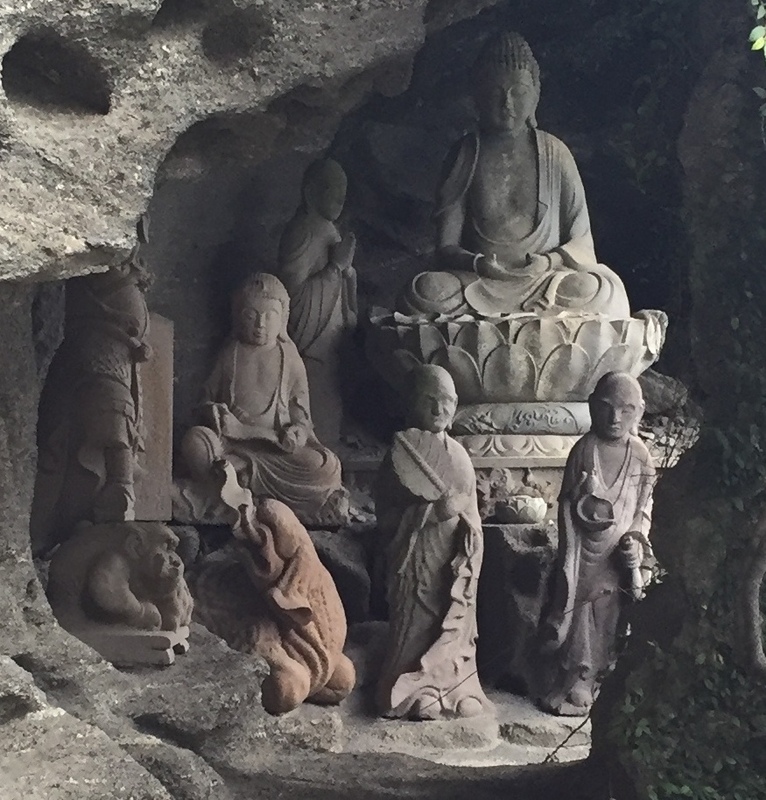 Thank you to City Cost (Shizuoka Green Tea) for the opportunity to visit Gyokuro-no-Sato, and thanks to The World Green Tea Association for their hospitality and generosity.